Time for a new interview! If you are new to my blog, I have been interviewing small businesses in the West of Ireland since 2016. Check out all the interviews I have done to date. The last interview was with An Mheital Rothar, Galway’s Community Bike shop and excited the present my newest interview with Gary Casey from Athastour walking tours in Galway. I was walking around Spanish Arch in Galway City, and just as I walked under the Arch I saw Gary, so I thought I’d go over and say hello! So how does this interview work, and how can you get interviewed? I have learned that people aren’t responding to email anymore, and have gotten most of my completed questionnaires via Facebook or Twitter. The interview exists out of a number of questions that are stored in the cloud via Google docs. I then send a link , the interviewee clicks on the link, enters the answers to the questions and the beauty is there is no need to send documents over email. I love it! I then review the questions, ask for clarifications if needed, and then publish. So if you are up for a close-up  of your business/startup in the West of Ireland, please drop me an email here or connect me with on my Workinglivingtravellinginireland Facebook Page or Twitter. I do read my email! And remember, the more you put in, the more you get out of it. Please share this interview, as I’d like to start a small movement to highlight the brilliant businesses in the West of Ireland! My name is Gary Casey, 40, from Galway. I run Athas Tours guided walks of Galway city. 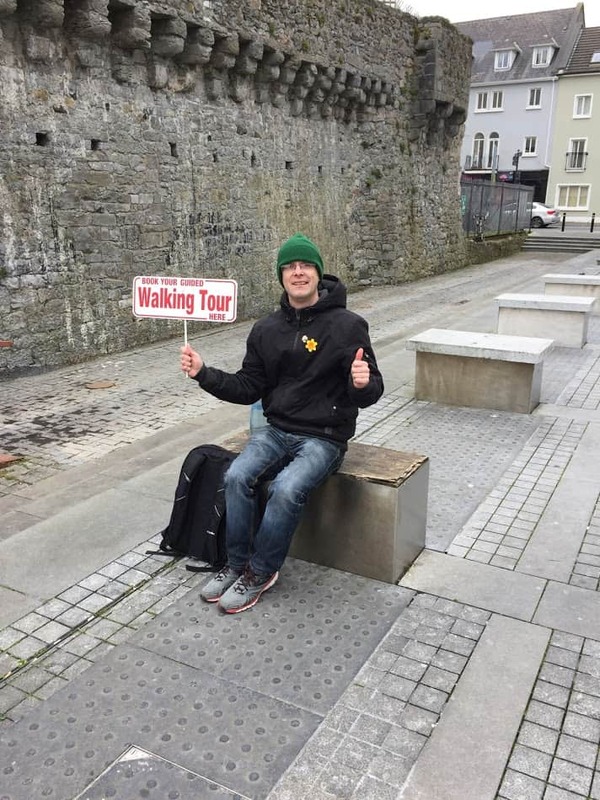 Athas Tours provided individuals and groups the opportunity to walk around and see all the main Galway city sights in a fun and energetic way. I am a sole trader at the moment and do the tours myself. I have been in business since February 2017 in this business. I did a course on setting up a business and decided to follow through on this idea. It is a bit of both, not quite full-time yet, but hopefully soon. I have seen how well-run Galway is as a tourist city. The most necessary skill is telling a story with a bit of wit attached and I think I can manage that! How do the social, economic, environmental, technological, legal and political environments impact your business? They all have a bearing on it. Economic tourism is the key i.e. keeping the tourist economy competitive. The rest are secondary to this. Keep Joe Tourist interested by not ripping him off and giving him value for his notes. I know very well who they are the buggers. Seriously, I think they compliment me and vice versa. Room for all. I market via social media but try to keep costs down as Facebook etc can be expensive. I am just going week on week. I hope to be able to expand enough to eventually get a minibus and expand to driving tours. Do you plan to compete in the global market place? If yes, how? If no, why not? I would love to but have not thought it fully through. It is really everything, just as in every other business. What do you love about the area you live in/do business in? It is life itself. A flaneurs dream. People of all walks of life mixing in Galway’s tiny medieval streets, all searching for answers to questions asked forever. I have talked to several historians and online is an invaluable source of opinion. Anybody is a potential customer. I just need to make them believe! Questionnaires from nice people I meet on the streets. Do you support local charities? If so which is your favourite charity and why? Yes and I fundraise. I have collected for the GRCC and GAA. Anything special things planned for 2017? Lots but I won’t share just yet! DON’T OVERTHINK. As Nike and Arnold say, Just Do It. That questions lead to answers and sometimes more questions. Life is a big circle. That is good. Never let it get too square or triangular. Just a quick reminder, please share this interview, as I’d like to start a small movement to highlight the brilliant businesses in the West of Ireland! If you would like to be next, please drop me an email to katleen@workinglivingtravellinginireland.com and I’ll be in touch. Thanks for reading & sharing & commenting!